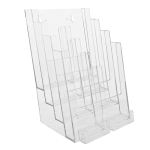 The Wall Mount Double Pocket Tri-fold Brochure Holder allows you to have two tri-fold pockets (4” wide) side by side. 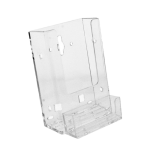 Simply guide the pocket divider into the pre-molded slot and you have created a simple, inexpensive custom display. This versatile brochure holder will double your exposure in one simple application. 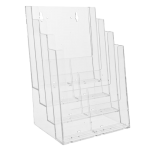 For literature up to 4 1/2'' wide, where two facings are desired. 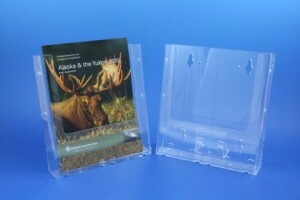 The pockets in the brochure holder are perfect for brochures commonly referred to as tri-fold. Convenience stores, credit card application, multiple wall displays, hotel lobbies, concierge desks.